The stabbing of three people - including a police officer - in Manchester is being treated as a terrorist investigation, police say. A man, aged 25, was arrested on suspicion of attempted murder after the attack on New Year's Eve at the city's Victoria railway station. The BBC understands the security services are assisting police. The three victims were taken to a nearby hospital with "serious" but not life-threatening injuries. A woman, aged in her 50s, suffered injuries to her face and stomach, while a man - also in his 50s - has injuries to his stomach. The officer, a police sergeant in his 30s, sustained knife wounds to his shoulder during the attack, but has since been released from hospital. Manchester Victoria railway station has reopened after the stabbings. Assistant Chief Constable Russ Jackson, of Greater Manchester Police (GMP), told reporters at a briefing at force HQ the suspect lived in the Cheetham Hill area of the city. Media captionGMP Chief Constable Ian Hopkins says the incident is being treated as "a terrorist investigation"
Earlier, officers raided a newly built semi-detached house on Schoolside Close, a mile north of Manchester city centre. Resident Nousha Babaakachel, 40, said a Somali family lived at the address, a mother and father of five, in their 40s, who came to live in the street about 12 years ago from the Netherlands. She said two of the four sons were at university, one works at Manchester Airport and the youngest is back in Somalia. They also have a daughter. Both parents attend the local Khiza Mosque. At the briefing, Greater Manchester Chief Constable Ian Hopkins said: "I know that the events of last night will have affected many people and caused concern. Mr Jackson added that "given how frenzied the attack was" officers were considering the mental health of the arrested suspect. "There is wide reporting in the press about what the attacker allegedly said during the incident and because of this we want to be clear, we are treating this as a terrorism investigation," he said. 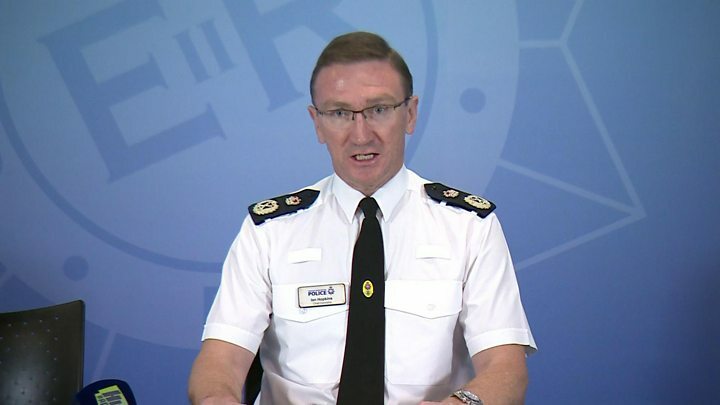 He explained officers were "retaining an open mind in relation to the motivation for this attack", and said there was no information "to suggest at this time others are involved". Police recovered two knives at the scene but do not yet know if both were used in the attack. Manchester Metrolink said services to the station were operating "to the normal pattern" but advised of "minor delays". Officers said counter terrorism police were leading the inquiry. Prime Minister Theresa May and Labour leader Jeremy Corbyn both said the victims were in their thoughts, with Mrs May praising the "courageous response" of the emergency services, and Mr Corbyn highlighting their "bravery". The Home Secretary Sajid Javid said he wished those injured a "full recovery". ACC Sean O'Callaghan, from British Transport Police, said he was "incredibly proud" of the four officers who detained the suspect. They were "fearless, running towards danger and preventing further harm coming to passengers," he said. BBC 5 live producer Sam Clack, who had been at the station at the time, said he saw a man stabbed on a tram platform at the station "feet from me". Mr Clack also said he heard the knifeman shouting "Allah" during the attack, along with a slogan criticising Western governments. He added he was "close to jumping on the tracks" as the attacker had a "long kitchen knife". 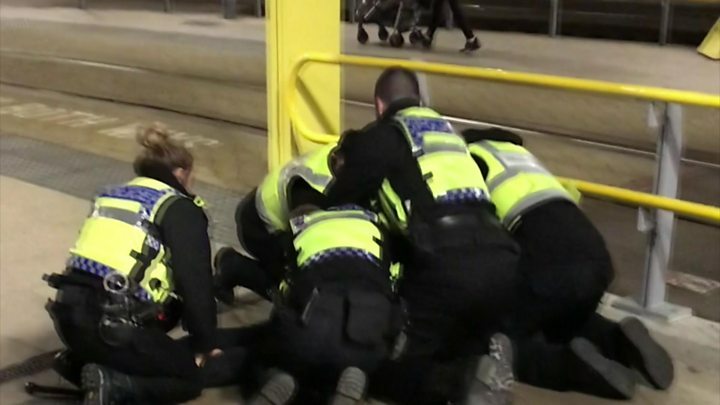 Greater Manchester Police, which declared the attack a "critical incident", said it understood that people would be worried but there was "no intelligence to suggest that there is any wider threat at this time". The Mayor of Greater Manchester, Andy Burnham, said the attacks appeared to be an "isolated incident". 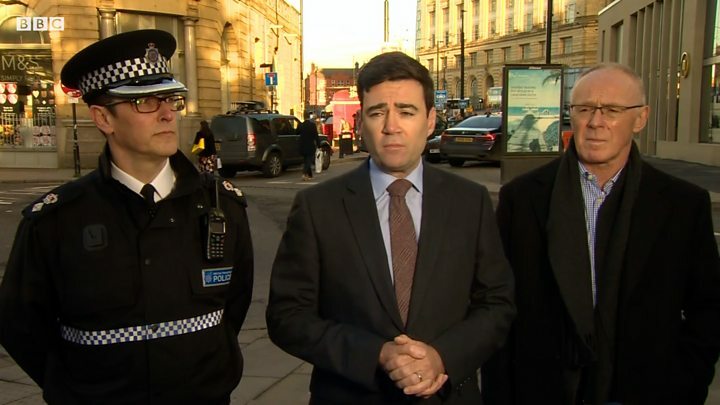 Media captionMayor of Greater Manchester, Andy Burnham: Stabbings appear to be "an isolated incident"
Mr Clack said he first "heard this most blood-curdling scream and looked down the platform". "It looked like they were having a fight, but the woman was screaming in this blood-curdling way. I saw police in high-vis come towards him. He came towards me. "I looked down and saw he had a kitchen knife with a black handle with a good, 12in blade. It was just fear, pure fear." Image caption Police said there was "no intelligence to suggest that there is any wider threat at this time"
He said police used pepper spray and a Taser on the detained man, who he said had been "resisting arrest". He said he saw "six or seven" officers on top of the man, who he described as "very skittish". "He was very aggressive and very intent on causing more harm than he actually did," he said. Police said the woman had injuries to her face and abdomen and the man had injuries to his abdomen. The New Year firework display in Albert Square went ahead.